As the weather begins to warm up – there are far fewer frost days once April comes around – grocers and even – shudder – supermarkets across the country begin to stock all manner of wonderful seasonal ingredients. Two of my favourites? You guessed it. This recipe for Radish, Watercress and Potato Salad highlights the best bits of British food in April/May. Salads should always be an ocean of contrast, and this recipe is a prime example. 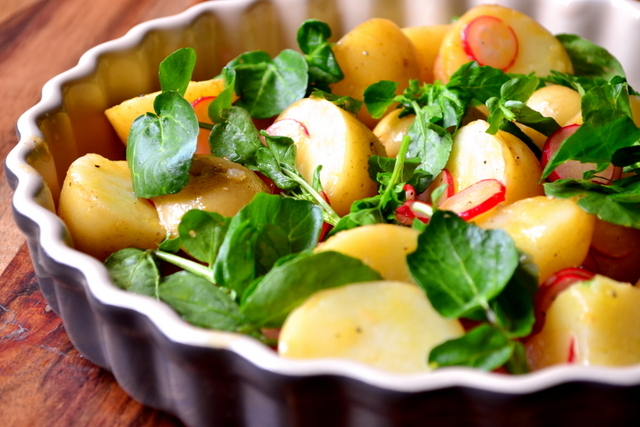 In terms of flavour the watercress and radishes add a hint of pepper; only a little, but plenty to liven up the subtle nuttiness of your new season potatoes. On top of that you get to experience the crunchy, juicy texture of perfectly formed slices of refreshing radishes. It’s a sensory smorgasbord. My pet peeve when it comes to potato salad is when people bog all of this wonderful produce down, smothering it with far too much mayonnaise. Yes, your dressing wants to have a kick to it, you want to know it’s there, but have a little restraint. Half a teaspoon of mustard mixed with some fantastic extra virgin olive oil and lemon juice does the tricky magnificently. This may sound very expensive, but remember the ingredients you’re using. 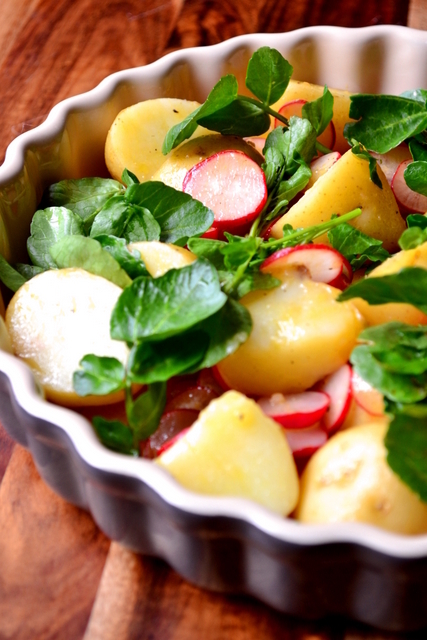 There’s nothing dear about radishes or potatoes. Good quality olive oil and watercress can be pricey, but the trick is to make them stretch. After all, you don’t cook with extra virgin, you use it for drizzling on special occasions. Boil your halved potatoes in slightly salted water until soft through – make sure not to overcook. Meanwhile top and finely slice your radishes and gently whisk together the olive oil, lemon juice, mustard and black pepper. Once cooked drain your potatoes and rinse with cold water. Transfer them along with the radishes to a suitable dish. Drizzle with the dressing, generously coating each potato and finish with a handful of watercress. Cost: As mentioned above, though there is an element of expense to this salad, it appears in such small quantities as to make almost no difference. Remember, good-quality ingredients can be enjoyed frugally – it’s about restraint. Indeed, this delicious salad for two, or side-dish for four should set you back no more than £2. A brilliant, frugal taste of the season. I do find this one very inspiring. Thank you. My pleasure – thanks for reading it. What a beautiful and delicious looking salad! I would much prefer this salad over the heavy mayo ones (I’ve never been a fan). This salad is perfect for picnics and potlucks. I’m definitely going to make this one for our next gathering at the family cottage. Can’t wait! Thank you. I hope you and your family enjoy it – sounds like a good time. The peppery bit of radish and watercress make for a great tasting potato salad I’m sure plus gives such pretty color to the dish. Radishes are amazing. 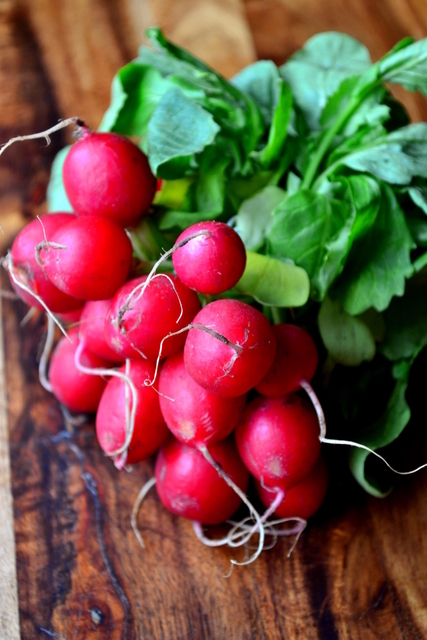 I have a roasted radish salad waiting in the wings – they are just so pretty. The dressing sounds lovely. I always thought I didn’t like potato salad until a couple of years ago because I’d only had it with creamy dressings. I always make an oil and vinegar/lemon juice based dressing now and I love it. Thank you. It’s far better/lighter/more tasty without mayo/cream! 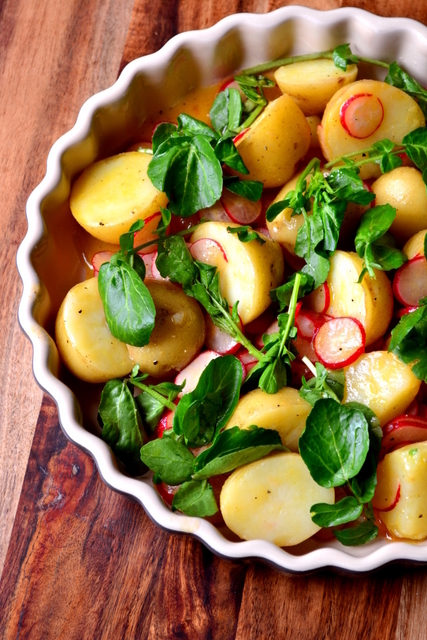 This looks lovely; I love the idea of pairing soft potatoes with the crunch and soft bitterness of radishes. And you’re totally right.. why mayo!? We also toss in olive oil, lemon and french mustard. So much lighter and yummy! Mayo just swallows everything – far better without it. Oh it was – really enjoyable spring food! That is a lovely combination. I discovered the joy of potato salad made without mayo a couple of years ago and haven’t looked back. Me neither, it just isn’t necessary!